It may be possible to have a bad meal in Louisiana, but it hasn’t happened to me yet. Everything from shrimp out of the back of a van to the off-the-track little diners and restaurants to the palaces of New Orleans to mom-and-pop boucheries in Cajun Country, Louisiana is an eater’s paradise. Cajun boudin is not the least among the state’s culinary glories. Cajun boudin (boo-dan) is unlike French boudin, which is a more general term for sausages there. Cajun boudin is more like a meat stuffing packed into a hog casing and poached, grilled or smoked. Some people eat it by squeezing out the good stuff from the casing — sometimes onto a cracker (Saltines appear to be the general cracker of choice), squirting some mustard on it and sitting on the back of your tailgate munching away and pondering the mysteries of life and sausages. 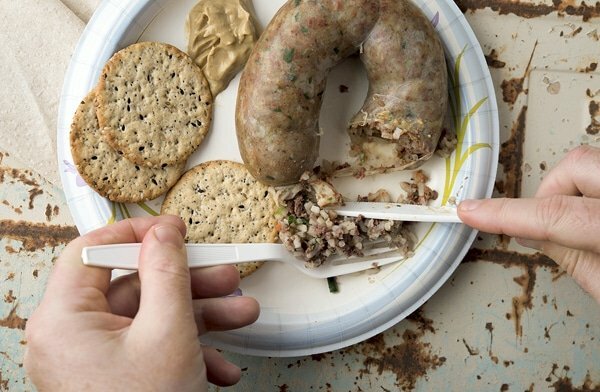 Many others skip the crackers and just eat boudin like a meaty pop-up popsicle. Boudin is a meal in a bite: Meat, fat, carbs from the rice, lots of vegetables and plenty of spice. Like dirty rice in a casing. It’s Cajun fast food. 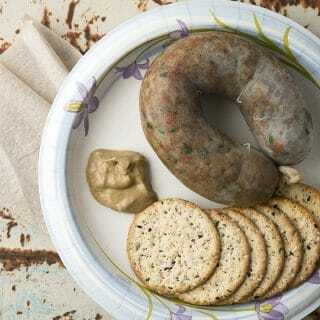 If you are a hunter or an angler, boudin is a dish you need to know about, because Cajun boudin can (and is) made from pretty much anything. Pork yes, but also duck (as I did in this version), venison, rabbit, alligator, chicken, crawfish, shrimp, crabs, nutria, quail, turkey… you get the point. And since you grind everything, it’s a fantastic way to use the wobbly bits like livers, gizzards and hearts. You won’t really notice they’re in the boudin, and you get the satisfaction of a) not wasting parts of the animals you’ve hunted, and b) telling your offal-hating friends what they just ate — after they’ve eaten seconds. Or thirds. 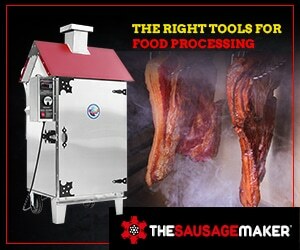 How do you make this wondrous sausage? I honestly had no idea until I got a chance to tour Cajun Country as the guest of the folks from Tabasco a few years ago. Among other things, they introduced me to Legnon’s Boucherie in New Iberia. Ted Legnon is famous both for his cracklins’ and his boudin, but I honestly can only eat a few crackin’s at any one time. I can eat inordinate amounts of boudin, so I focused my attention to that. Boudin is a cooked sausage, in that everything is cooked before it’s ground up and stuffed into a casing. They’re sold in long links that are often tied into a ring and either poached and served or smoked to be eaten on the go. It’s a sloppy mixture that is only loosely stuffed into the casings — very unlike the tight stuffing you do with German sausages to get that characteristic knacken or snap. Ratios of meat to rice vary; Legnon’s goes for a 1:1 ratio. My recipe is a little more meat-heavy. The sausage can be mild or very spicy, with lots of vegetables (usually the “trinity” of onions, celery and green peppers) or few, red with paprika or just a humble gray. The point is that everyone makes boudin differently, and I’d be insane to claim that my recipe is definitive. But I did learn from Legnon’s and I’ve eaten an awful lot of boudin, so I can tell you that my boudin is at least in the ballpark, even if it’s different from how your grandma or your local boucherie makes it. If your boudin is different, how so? I’d be interested in hearing your variations. Boudin can be made with basically any meat or seafood. Crawfish are as good as pork in my opinion. So use what you have in your freezer or fridge and have fun with it. If you don't want to make cased boudin, roll it into balls, bread it and fry it for the ultimate Cajun party treat. My recipe below is an amalgam of what I saw at Legnon's, from Chef Donald Link's book Real Cajun and from former Tabasco cook Eula Mae Dore's book Eula Mae's Cajun Kitchen. Chop the meats, liver and fat into chunks that will fit in the grinder. Mix the meats, liver and fat with the onion, celery, poblano peppers and garlic, then the salt, curing salt (if using) and either the Cajun seasonings or the spice mix you made from this recipe. Put it all in a lidded container and set in the fridge at least an hour, and up to a day. Put the contents of the container into a large pot and pour in enough water to cover everything by an inch or two. Bring to a simmer and cook gently until everything is tender, at least 90 minutes and up to 3 hours. Strain the cooking liquid (you'll need it later) and spread the meat, fat and veggies out on a sheet pan to cool. When everything is cool enough to handle, grind it through the coarse die (6.5 mm) on your grinder. You can also hand chop everything. Put your meat mix into a large bowl and add the cooked rice, parsley and green onions. Mix well, and add up to 4 cups of the reserved cooking liquid. Mix this for 3 to 5 minutes so you make a more cohesive mixture to stuff into a casing. You now have boudin. You can just shape the mixture into balls and fry them (they're awesome), or use your boudin as stuffing for something else, like a turkey. Or you can case it. Stuff the boudin into hog casings, and while you're doing it, get a large pot of salted water hot -- not simmering, just steaming. You want the water to be about 165ºF to 170ºF. Poach the links for 10 minutes, then serve. If you are not serving them right away, no need to poach the links yet. Boudin does not keep well, so eat it all within a couple days. It does freeze reasonably well, however. Note that while I poach my boudin, the links are also excellent grilled or smoked. If you smoke them, you absolutely need to use the curing salt, Instacure No. 1, which you can buy online or in some butcher shops. Make this if you can’t find store-bought Cajun seasoning. It’s a little different from my normal spice mix, but it’s reflective of what you often find in boudin. If you want a redder sausage, increase the paprika. If you want it less spicy, reduce the cayenne. 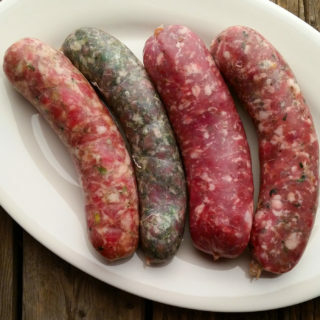 Find dozens more recipes for fresh sausages, from andouille to brats, Italian to kielbasa and more, here on Hunter Angler Gardener Cook! If I were to use a pre mixed cajun seasoning blend, should I scale down the 4T of salt? Considering pre mixed spice blends have salt in them. I notice your spice blend doesn’t contain any salt. Dakota: Absolutely. I might even cut it back to 1 tablespoon of salt in that case. I’m from Louisiana so I know I know what good boudin tastes like by far one of my favorite recipes to make. I’ve been looking for a boudin recipe to try out, for some time now. I ‘ve made kielbasa and andoui, chorieso, and brats, multiple breakfast sausages. But no boudin yet!